RF IDeas' pcProx card readers are designed for customers seeking to leverage their existing card system for applications beyond building access. The pcProx Enroll readers are engineered to work with nearly all proximity and contactless smart card technologies. This 13.56 MHz contactless model is compatible with most 13.56 MHz cards. Featuring plug-n-play functionality, no required software, and embedded configurable flash memory, these readers are ready to integrate with nearly all operating systems, applications, and embedded controllers. 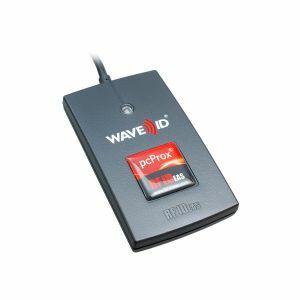 As a card enrollment or ID badge reader/tester, the USB model emulates a keyboard and keystrokes the card's ID and/or site code to the cursor's location on the screen. The reader can be configured to add keystrokes before and after the card's data.